"This more efficient and effective way to harness wind power could seriously change the face of the alternative energy industry," says Kamen George Kamenov. “This more efficient and effective way to harness wind power could seriously change the face of the alternative energy industry,” Kamenov says. And, with dwindling conventional energy sources for electricity production, wind power is on the rise. Natural energy forms, when properly managed, are inexhaustible. It should also be noted that according to the U.S. Energy Information Administration, wind capacity will increase by 8.8 percent to about 66 gigawatts (GW) by the end of 2014 and will increase 14.6 percent to total more than 75 GW at the end of 2015. So, this new invention for wind turbines is not only timely, but also well positioned for growth. How do wind turbines work? Wind turbines convert the wind’s kinetic energy into mechanical power through the use of a rotor with blades that spin a shaft. The shaft is connected to a generator that converts the mechanical power into electricity. The swept area is the total area inside the imaginary circle, which the blades make when they turn under the wind pressure. The larger the swept area, the more wind energy is captured. However, if you double the length of the blades, the swept area increases four times. “That is the secret of this invention – increasing the length of the blades with no additional cost and at the same time reinforcing them so that they don’t break. Long blades are very expensive, unbalanced and can get damaged or break easily,” Kamenov says. The advantages of using wind energy are that it’s renewable, nonpolluting and free. Disadvantages include diluted and unpredictable energy results, and high initial and maintenance cost. This new invention is designed to meet many needs. They include the ability to reduce the cost of converting wind energy into electricity by providing a better construction and reinforcing and/or replacing the rotor and the blades with new and more efficient ones. It also hopes to use all wind potential, weak and strong and in more remote and high-location areas. Available for licensing, some European, Chinese and Indian manufacturers and investors are already showing interest. Patent specifics can be found here: http://www.google.com/patents/US8629570 or here: http://patft.uspto.gov/netahtml/PTO/srchnum.htm. Simply search for Patent #8629570, or contact the inventor at: kamengeorge@gmail.com; or kgkamenov@yahoo.com. – Photo 300dpi: https://www.send2press.com/wire/images/14-0304-wind-turbine_300dpi.jpg . 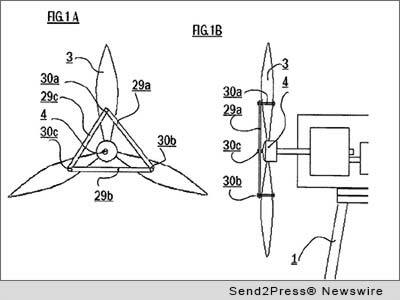 – Photo Caption: New Patent for Wind Turbine Industry. Original Keywords: Kamen George Kamenov, US Patent 8629570, wind power, windmill blades, wind power patent, electricity production, renewable, nonpolluting Kamen George Kamenov San Francisco California SAN FRANCISCO, Calif.
REFERENCES: Business News, Kamen George Kamenov, US Patent 8629570, wind power, windmill blades, wind power patent, electricity production, renewable, nonpolluting Kamen George Kamenov San Francisco California SAN FRANCISCO, Calif.